Breakaway gaps or breakout gaps are some of the most powerful gaps that will propel a stock higher rapidly. They usually happen at consolidation areas or when a stock breaks a down trendline. 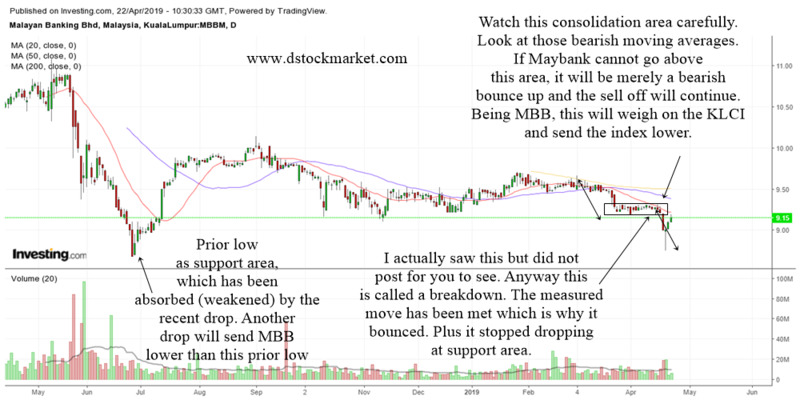 The combination of gaps and breakout is extremely bullish and will send the stock higher quite fast. This is perfect for those who like to find stocks that move up rapidly. 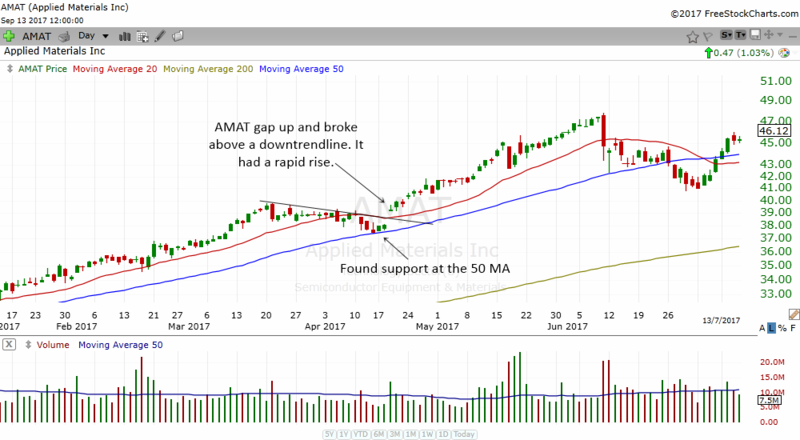 The chart of AMAT above is a real live example of a breakaway gap or breakout gap. The gap itself is very obvious to everyone. The stock opened way above the previous day's closing price. At the same time, the stock gap up above a down trendline. This may not be that obvious to most people because most won't be looking for a down trendline. But for traders who are observant, this is a breakaway or breakout from the price pattern. Notice how the stock had a nice run up since the breakaway gap. 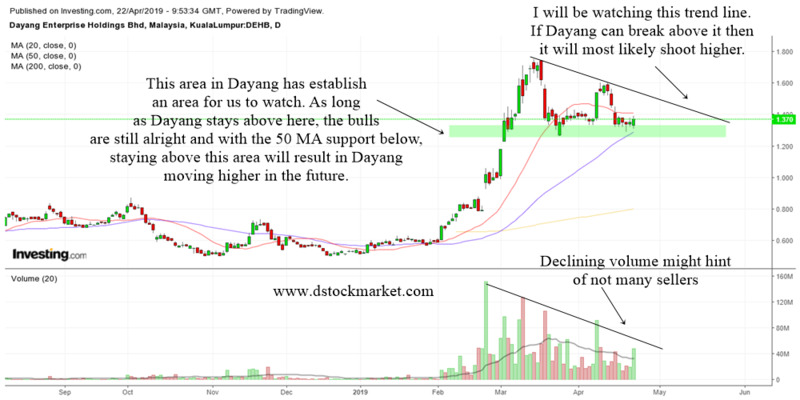 Since this stock is in an uptrend, the probability of the stock moving higher is very good. Which brings us to another benefit of breakaway gaps. This chart pattern can be a trend following pattern. Breakaway gaps can be bullish or bearish depending from where it breaks out. A gap up is usually considered bullish since it is good earnings of some positive expectations that produces a price gap up from the previous closing price. Let's say the company reported stellar earnings and give a guidance that is beyond what analyst expects. This stock will immediately become hot stuff and by tomorrow morning, everyone will want to buy it. The law of supply and demand will cause the stock price to gap up because too many people want the stock. The chart of COST shows how gaps play a role in the short term price movement of COST. By learning as much as you can about gaps, you can easily have an idea what the stock might do in the short term to medium term. 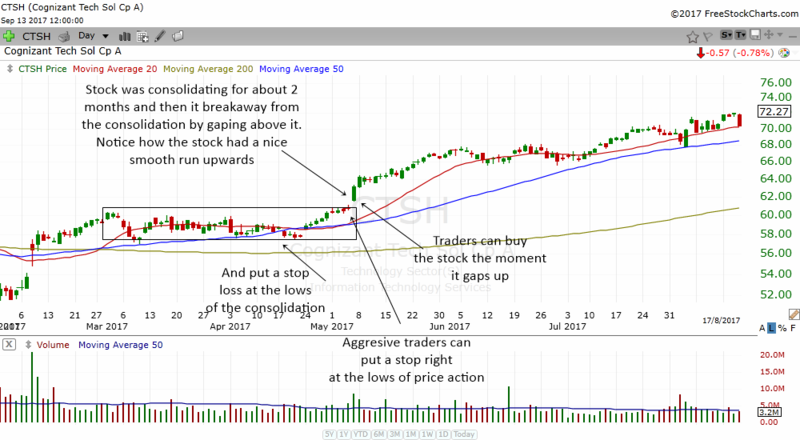 Around mid December, the stock gapped up away from a consolidation. This is a breakaway gap. Notice how the stock rose rapidly for more than a week. 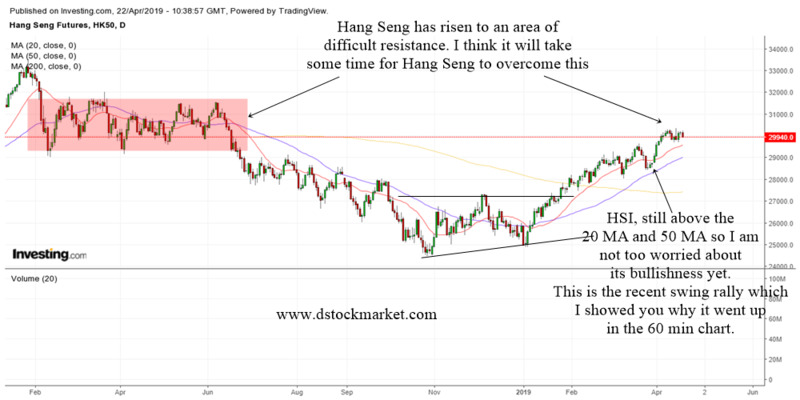 This provided a great swing trading opportunity for traders. It then formed another consolidation and gap up again. This time, the gap up is called a continuation gap or measuring gap or runaway gap. The reason is the second gap often gives us a price target. The trader can take the previous upwards move until the second gap and then project it upwards to get a price target. 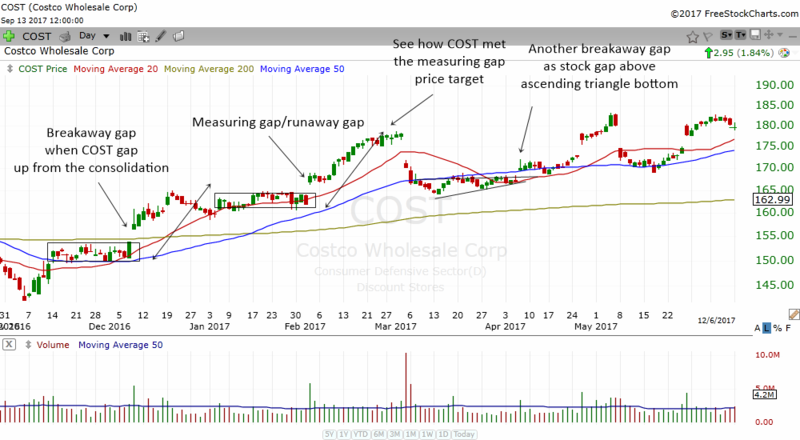 In this case, the measuring gap provided a perfect textbook example of how to set a price target using measuring gaps. In April 2017, the stock once again experienced a breakaway gap. This time the stock bottomed and formed an ascending triangle bottom. The stock gap up above the ascending triangle pattern. 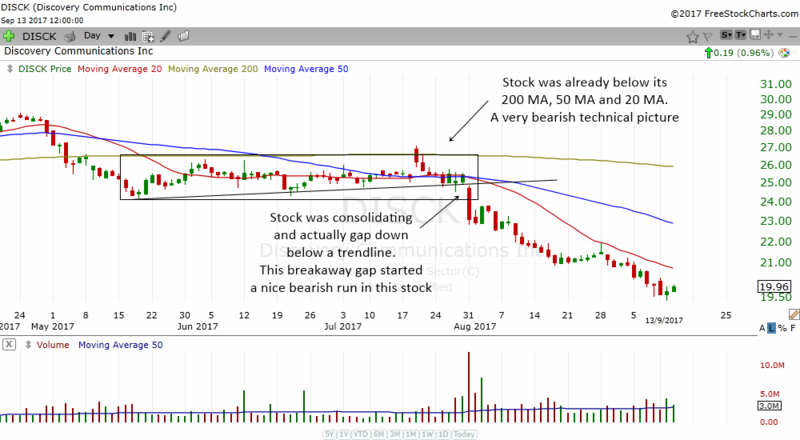 Although the stock did not rise immediately, it later produced a nice gain for traders. The bearish breakaway gap happens when a stock gaps down. Whenever a stock gaps down it usually produces some negative reaction. The price pattern becomes even more negative if the breakaway gap happens after a consolidation or breaking of trendline. In the chart above, DISCK had a long consolidation. It also formed a trendline which the observant trader will notice. The stock then gap down and this produced a bearish breakaway gap from the consolidation. While the gap is not very big, it is still very noticeable to the trained eye. Coupled with the fact that this stock is already below its 200 MA, 50 MA and 20 MA, the gap down actually ignited a bearish move in this stock which traders can take advantage of. CSX is another good example of how a breakaway gap can produce a short term drop in a stock. Right up to July, CSX was trending higher making higher highs and higher lows. Observant traders would have drawn an uptrendline to assist them in spotting trend changes. The stock then gapped down below the trendline and this is a breakaway gap that produces a short term drop in CSX. 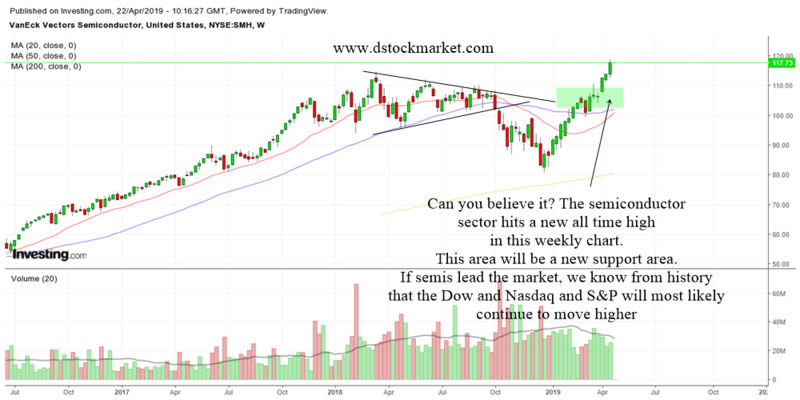 The mere fact that a stock breaks out of a pattern is a potent signal that price will be moving rapidly in one direction very soon. When you have a gap up or gap down accompanied by a breakout, this is a big signal that something is going to happen to the stock. Therefore, many traders will focus on the stock and will see if they can take a trade. Buy the moment the stock gaps away from the pattern and put a stop loss at the nearest pivot. Buying a breakaway gap looks easier than it is. First of all, not many traders will be able to spot the significance of a gap up. They just know that the price is showing a 1% gain or 2% gain in pre-market hours. To be able to recognize that the stock is gapping up in a significant way requires some experience and training. In the chart above, CTRP actually was forming some kind of a triangle. The focus will be on the upper trendline. An observant trader would have drawn a trendline but he or she does not know yet whether the stock will trade above the trendline. In order to be alerted the moment the stock trades above the trendline, the astute trader will use an alarm. The moment the alarm goes off, the trader quickly checks how much the price has gone up. Sometimes, when looking at the pre-market price, the trader might notice a 1-3% gain in price. When the market opens, the trader will press the buy button. 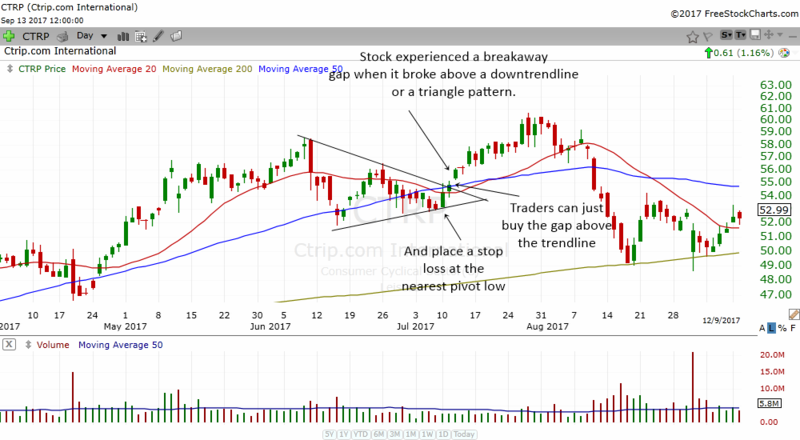 In the case of CTRP, many traders will be ready to buy the stock the moment it gaps up above the trendline. They will place a stop at the nearest pivot low. CTSH above is another good example of how to trade a breakaway gap. The stock was consolidating from March to May 2017. As it nears the top of the trading range, the stock suddenly gaps up. This is a breakaway gap. The trader who is observant would have drawn a box to make the consolidation easier to see. Then he or she will put an alarm to make use of the trading platform to help monitor the breakout. The alarm would have alerted the trader and then a buy order can be place. To put a stop loss, the trader can put a conservative stop loss at the lows of the consolidation. For the aggressive trader, they might put the stop loss at the lows of the recent trading bars. The reason for this is if the stock gaps up, it is a signal of strength and it should not even trade below the lows of the candle bars at the top of the consolidation. Once the stock starts to run up, the trader can use a trend following method to capture the profits. A trailing stop loss can be used. 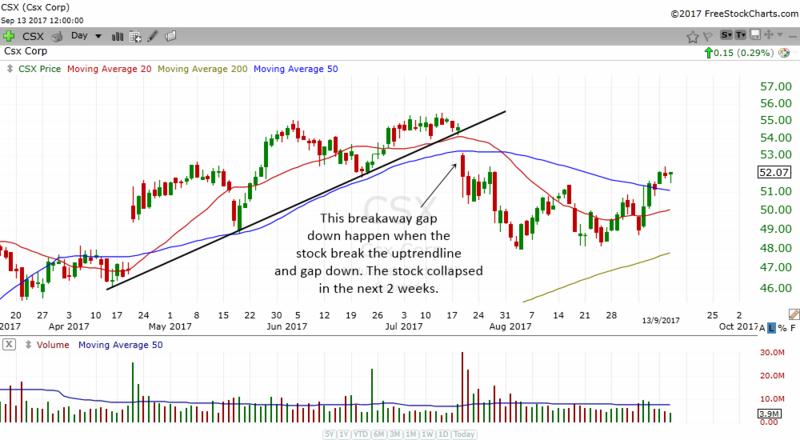 The breakaway gap or breakout gap is very useful to find stocks that are starting a bullish or bearish momentum of its own. 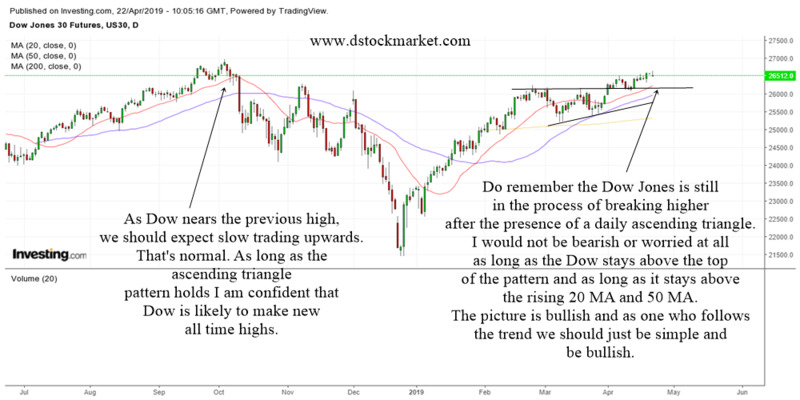 In order to spot a gap that has potent and significant value, the trader should be expecting it by looking for stocks that are making patterns, consolidation and about to break a trendline. Then he or she can put an alarm to monitor it. Alternatively, the trader should be on the lookout for any stocks that are up pre market. Then the trader can see if any significant pattern is forming in the stock.